Using Fanspeak's On the Clock mock draft simulator, I drafted as the Patriots for all seven rounds of the 2017 draft. The Patriots are as unpredictable as it gets on draft weekend, but I did my best to make my selections as I think they'd make them given the board at hand. I used Bleacher Report's Matt Miller's Big Board and NFL Mock's Team Needs for the simulation. Here's how my draft shaped out. I was surprised that Melifonwu was available this late in the draft (and will be surprised if that happens two weeks from now). In this case, BPA trumped a lack of immediate need at safety, where Devin McCourty, Patrick Chung, Duron Harmon and Jordan Richards are all signed for the next two seasons. However, Melifonwu is a freakish talent with the potential to develop into a high upside successor to Patrick Chung's sneakily important role in the Patriots defense. His combination of elite athleticism (4.4 speed, 11'9" broad jump, 44" vertical), size and length make him uniquely qualified for the jobs the Patriots ask of Chung. Man coverage responsibilities, be it in the slot or matching up with backs and tight ends, top that list with regards to importance due to the amount of athletic pass catching tight ends in the league. However, at 6'4" and 225 pounds, Melifonwu also has the size and physicality to hold up as a run defender when deployed as a dime linebacker, another role the Pats ask of Chung. 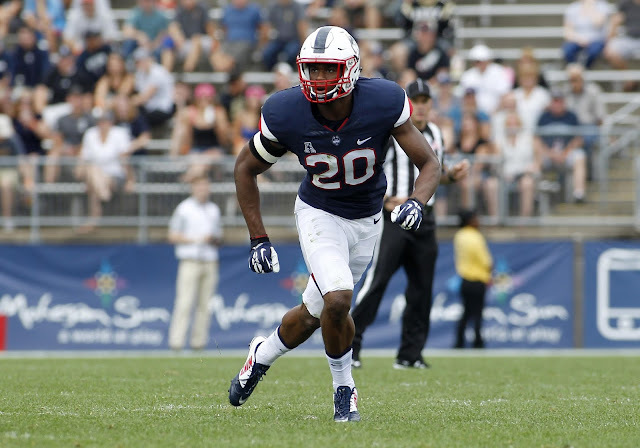 The Patriots have certainly done their homework on the UCONN standout, meeting with him in some form at the Senior Bowl, Combine and his Pro Day. Melifonwu's athleticism and physicality should translate to special teams contributions while he develops as the eventual successor to Chung, who at age 29 has just two years remaining on his contract. Auburn defensive end Carl Lawson also received serious consideration for this pick, but I ultimately viewed Melifonwu as a far safer prospect due to Lawson's troubling injury history. I had a number of directions I could go with this pick. Auburn's Lawson was still available as a tempting boost to the Pats pass rush. I also strongly considered Florida cornerback Jalen "Teez" Tabor, a high-upside prospect who was widely thought of as a first round talent before poor athletic testing numbers (apparently compiled while battling a balky hamstring) and a reputation for volatility sent his stock plummeting. In the end, the importance of the left tackle position led me to go with Davenport, a high-upside project the Pats seem to have taken a liking to. 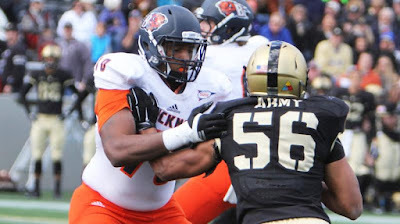 At 6'7" and 318 pounds with 36 1/2" arms, Davenport has an ideal combination of size and rare length for the left tackle position, where he started all 44 games of his collegiate career. His raw talent (Davenport is also a solid athlete for the position) was more than enough for Davenport to dominate his competition in the Patriot League, where he earned first team all conference honors each of the last three seasons. It also gives him the upside to develop into a quality starting left tackle at the NFL level, but that will take some time. Not only will Davenport be facing a massive leap in competition level, but he'll be doing so with unrefined technique that could use some tuning up. That, of course, is where Dante Scarnecchia will come in handy. The Patriots legendary offensive line coach reportedly put Davenport through a private workout, where he impressed both physically on the field and mentally in the classroom. Incumbent starting left tackle Nate Solder is signed for this season, but will be an expensive-to-retain 30 year old free agent next spring. If the Patriots are confident that Scar can make Davenport a quality starting option, they won't hesitate to get ahead of things with one of the game's most important positions. After all, that's exactly what they did back in 2011 with Solder, who spent his rookie year as a reserve behind impending free agent Matt Light. As a GM, I'd probably roll the dice on the upside of Tabor at this point, who wound up going 10 picks later to the Rams. However, I was drafting using the mantra "what would the Patriots do?" and ultimately decided they would pass on the potential headaches of selecting the volatile Tabor for Walker, who has received minimal draft buzz despite a highly productive collegiate career. 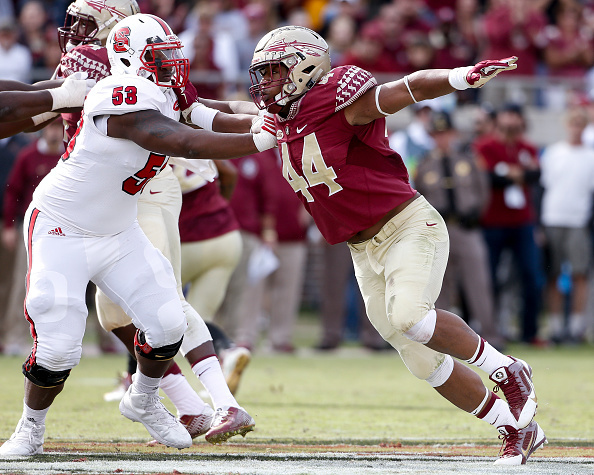 Walker racked up 26.5 sacks and 37 tackles for loss during his final two seasons at Florida State, including 16 sacks and 21.5 TFL as a senior this fall. Those numbers can be misleading with regards to his NFL projection, as he isn't particularly explosive as an edge rusher. Instead, Walker is a player that uses his sturdy build (6'4", 280) and length (33" arms) well to win physical battles at the line of scrimmage. Similarly to Flowers, he projects as a tough edge setter on early downs with the ability to reduce inside in passing situations. His versatility and dependability will certainly appeal to the Patriots, who interviewed him formally at the combine before working him out privately later in the draft process. With only Flowers signed beyond this season, selecting Walker serves as a necessary injection of youth to the position. Walker is unlikely to become a Pro Bowler at the next level, but he's a very good bet to develop into a valuable contributor in a rotation. That would be a more than acceptable return on a pick at this point in the draft. I was hoping Iowa tight end George Kittle would fall to this pick, but the Cardinals snatched him up six picks ahead of the Patriots. However, Langi isn't a bad consolation prize. A former reserve running back at Utah, Langi left football following his freshman season for a two year church mission. He transferred to in-state rival BYU upon his return and was promptly converted to defense, where he was moved back-and-forth between linebacker and defensive end over three seasons. Langi's stock was hurt by playing out of position as an edge defender last fall, but he would project as an inside linebacker with the Patriots. His best tape came in 2015, his lone full season as a starting linebacker and, unlike many of his peers in this draft class, Langi has the size (6'2", 251) the Patriots seek at that position. He's also an above average athlete for the position, as highlighted by impressive times in the shuttles and 3 cone drill at the combine. 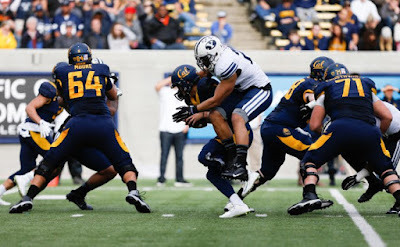 That quickness combined with good length (32 7/8" arms) gives him some developmental upside in coverage, but Langi is at his best when playing downhill, as he has the athleticism to shoot gaps and the strength to take on and defeat blockers. Linebacker is less of an urgent short-term need following the re-signing of Dont'a Hightower, but the Pats would benefit from finding a long-term bookend to play alongside their defensive leader. The trio of Shea McClellin, Kyle Van Noy and Elandon Roberts was enough to get by with in 2016, but none of those players played well enough to securely lock down the starting job for 2017. Langi is unlikely to earn major snaps amidst this group as a rookie, but he has the skillset to develop into a better three down option than any of them. That versatility has apparently caught the Patriots interest, who have long been connected to Langi. We have no idea whether there's any truth to former Packers (by way of BYU) linebacker Brady Poppinga's claim that Bill Belichick would have drafted Langi in the first round if he was available last year. We do know the Patriots sent two scouts to carefully monitor his Pro Day workout, where Farsided's Nate Cunninham reported one of them was overheard saying "we enjoyed watching you play the past couple years" to the potential linebacker. This was one of the easiest selections of the draft, as I valued Wilson's upside and versatility far more than any one else on the board at this point. Simply put, Wilson is a dynamic athlete, something he demonstrated loudly at his pro day with a 4.36 40 yard dash, 41" vertical leap, 11'1" broad jump and 24 reps on the bench. That athleticism alone gives him a chance at cornerback, where his inside/outside versatility will appeal to the Patriots. His length and ball skills allow him to compete on the outside against bigger receivers, but he also has the reactive athleticism to matchup with quicker, shiftier receivers in the slot. The Patriots will also love his aggressiveness in run support, which they've always required from their corners. With only one year under his belt as a full time starter at corner, Wilson is a bit raw and will need time to develop, but he'll bring immediate value on special teams. He was an extremely dangerous kick returner in his college career and would be a top option for that role as a rookie. He'd also be an option to return punts should Cyrus Jones continue his bouts with the butterfingers, and has experience on kick and punt coverage teams as well. Wilson could even provide depth at running back if need be, as he flashed in emergency duty as a two-game starter back in 2015. Still, I believe the Patriots would see Wilson as a cornerback with the reactive athleticism that could unlock a new level to his game. DraftAnalyst's Tony Pauline reported that the Patriots worked Wilson out privately in the week following his explosive pro day showing. I also liked Sprinkle's Arkansas teammate Deatrich Wise Jr in this spot, but the redundancy of his skillset with the previous selected DeMarcus Walker tipped the scales in favor of Sprinkle, who should compete immediately for a depth role behind the oft-injured duo of Gronk and Dwyane Allen. At 6'5" and 252 pounds, Sprinkle is big and physical enough to handle the blocking duties that will be expected of him in New England. He's not a dynamic mismatch creator as a pass catcher, but he displayed reliable hands in college, dropping only five catchable passes over the past three seasons according to ProFootballFocus. Sprinkle snatches the ball away from his body and knows how to use his big frame to shield off smaller defenders, a skill which should translate to red zone production. While not a dynamic athlete, he's got enough speed to give linebackers trouble down the seam and is far from a plodding blocking only tight end. His every down versatility will appeal to the Patriots, whose heavy usage of multiple tight end sets makes having a third capable tight end more of a need than a luxury. 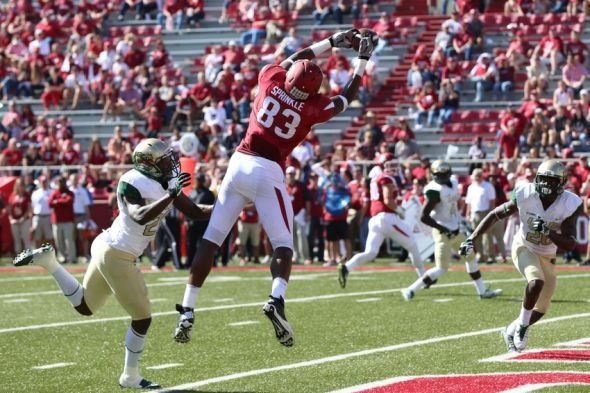 The Patriots got a closer look at both Sprinkle and Wise Jr at Arkansas' Pro Day. Slim pickings at this point in the draft. 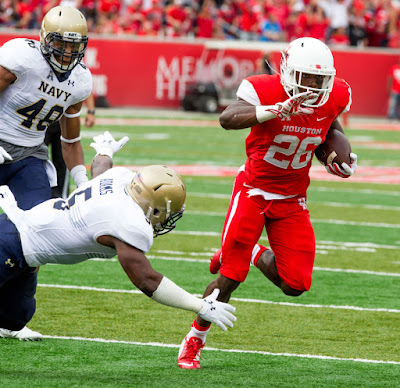 I liked the scheme fit and thus considered diminutive San Diego State running back Donnel Pumphrey and Louisville slot receiver James Quick, but both would face long odds of making the roster in crowded position groups. 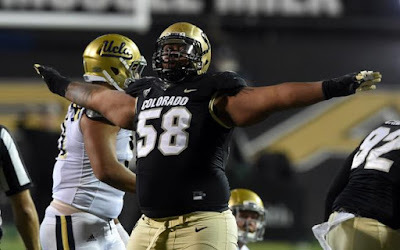 In the end, I felt like the massive (6'3", 325) space-eating Tupou would have a better chance of making the team as a depth option at defensive tackle. The Patriots value big bodied two-gapping defensive tackles more than most and Tupou's ability to command double teams fits what the Pats look for from their defensive tackles. Tupou's lack of explosiveness limits his pass rushing ability and thus his draft value to plenty of teams, but the Patriots are reported by Tony Pauline to be showing interest in him. The Patriots 2017 rotation seems set with Alan Branch, Malcom Brown and Vincent Valentine returning, but Tupou would give the team another option to develop for life after the 32 year old Branch.